The nearest neighboring major galaxy to the Milky Way is the Andromeda Galaxy. The large galaxy is stunning in size and has around three times as many stars as the Milky Way does. It can easily be seen with the naked eye from Earth, and it is found in the constellation of Andromeda, from which its name originates. Far from being just a pretty sight in the sky, the Andromeda Galaxy is an impressive, turbulent patch of the cosmos. It is even expected to collide with the Milky Way years down the road. 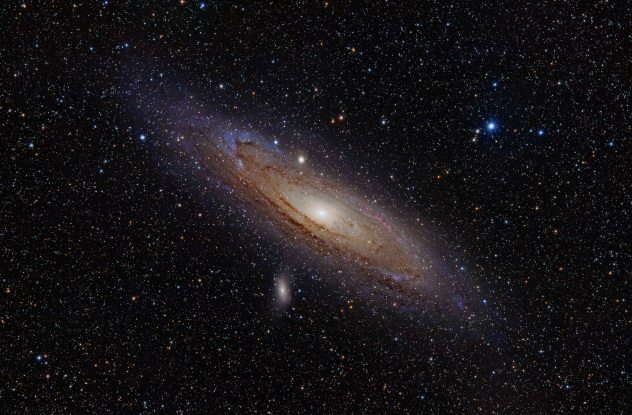 If you find that fascinating, then you are going to enjoy these ten amazing facts about the Andromeda Galaxy. In 1757, he had begun searching for Halley’s Comet, but the calculations given to him had sent him to a different section of the sky. That wrong section of the sky is where he observed a nebula that became the first entry in the catalog: M1, also known as the Crab Nebula. 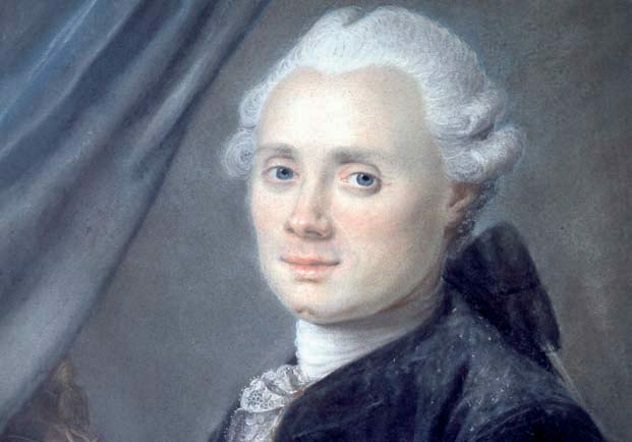 In 1764, Charles Messier added M31 to his catalog. By the end of the year, he had added a total of 38 objects. By 1781, he had logged a total of 103 objects into his catalog, 40 of which had been found by Messier himself. 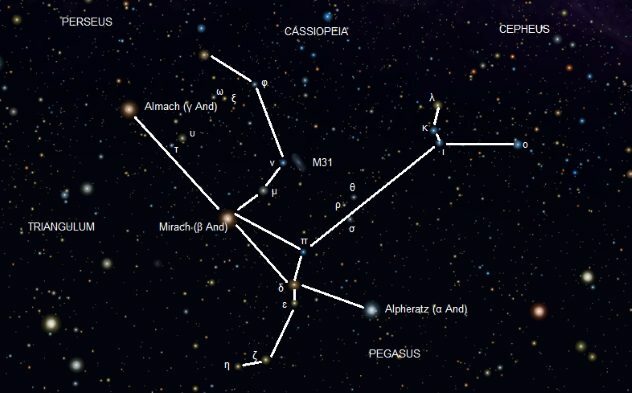 If you look up into the northern night sky between Cassiopeia’s “W” asterism and the Great Square of Pegasus, you will find the constellation Andromeda. The star pattern was named after the mythical princess Andromeda, the wife of the Greek hero Perseus. The constellation was first cataloged by the Greek astronomer Ptolemy in the second century, and it is also known by the names of Chained Maiden, Persea, or Cepheis. The Andromeda constellation is also home to various other deep sky objects. Andromeda is located outside the galactic plane, and it does not contain any clusters or nebulae of the Milky Way; it does contain other visible galaxies, though. The most famous of these galaxies is, of course, the Andromeda Galaxy, which gets its name from the large constellation. The constellation is best-known for the Andromeda Galaxy, which is one of the most famous objects in the sky that can be seen with the naked eye. In astronomy, a light-year is a commonly used unit to measure distance, but some astronomers prefer to use a unit called the parsec. When referring to something larger, they use kiloparsecs, which are equal to 1,000 parsecs, and megaparsecs, equal to one million parsecs. The Milky Way measures about 100,000 light-years or 30 kiloparsecs across. This may seem large, but it is rather small when compared to other galaxies. The Andromeda Galaxy has an approximate diameter of 220,000 light years, which is more than double of that of the Milky Way. It is the largest galaxy in the Local Cluster. 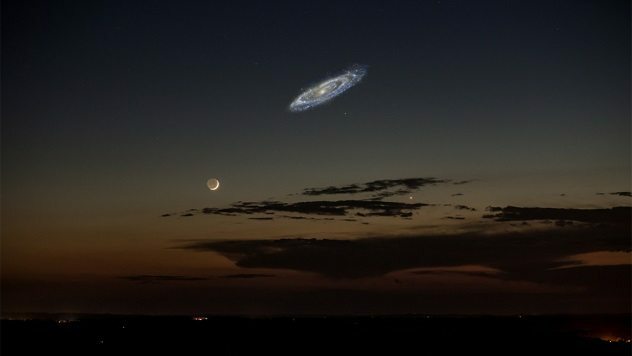 If it were bright enough, the Andromeda Galaxy would appear larger than the Moon in the sky (as depicted above), even with it being much farther away. The galaxy is 2.5 million light-years away from Earth, whereas the Moon is only 384,400 kilometers (238,900 mi) away—that should give you a better understanding of just how big the galaxy really is. The Milky Way is estimated to have anywhere from 100 billion to 400 billion stars, but the Andromeda Galaxy boasts around one trillion stars. NASA’s Hubble Space Telescope uncovered a large and rare population of hot, bright stars as a part of those one trillion. Blue stars are typically hot, young stars, but the blue stars found in the Andromeda Galaxy were aging, Sun-like stars that have cast out their outer layer of materials and exposed their blue-hot cores. These stars are scattered throughout the center of the galaxy and are brightest in ultraviolet light. Another interesting fact about the Andromeda Galaxy is that it contains a double nucleus. Both of the light-peaks contain a few million densely packed stars, and they are separated by only five light-years. The first nucleus is known as P1, while the second is known as P2. Some astronomers have determined that the nucleus isn’t really two pieces but rather just one lopsided group of stars that are orbiting a supermassive black hole. The stars in P1 follow elliptical orbits around the black hole and spend most of their time shining in outer regions, making the area appear bright. The second nucleus only exists because the stars bunch together when approaching the black hole. There is a huge war coming between the Andromeda Galaxy and our own. The Andromeda Galaxy is heading toward the Milky Way at 400,000 kilometers per hour (250,000 mph), which is fast enough to circle the Earth in just six minutes. It is estimated that it will take about 3.75 billion years for the collision between the two galaxies to occur. So what will happen to Earth after this collision? Experts believe that Earth will most likely survive. They believe our planet will be mostly unharmed because the galaxies are made up of mostly empty space. Earth could get a pretty incredible show out of the collision, though, and it would be seen throughout the sky for many years. The two galaxies will continue to tug at each other for years until the central black holes in each galaxy get close enough to merge as one. Once they have merged, our solar system will be in an entirely different type of galaxy known as an elliptical galaxy. If it wasn’t for the Sun swallowing the Earth in about five billion years, the sky would appear bright at night in the elliptical galaxy. In astronomy, the absolute magnitude is the apparent magnitude that an object would have if it were at a standard luminosity distance from us. This allows the overall brightness of an object to be compared without any regard to its distance. The Andromeda Galaxy has an apparent magnitude of 3.4, which is one of the brightest of any of the Messier objects. 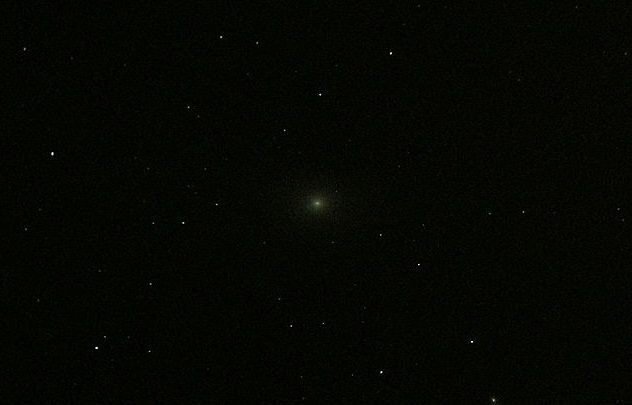 On a moonless night, the Andromeda Galaxy is visible to the naked eye, even when viewed from areas with moderate light pollution. It may appear more than six times wider than the Moon when photographed through a large telescope, but only the brighter central region is visible to the naked eye when using binoculars or a smaller telescope. The Andromeda Galaxy once had nine known black holes, but that number went up to 35 in 2013. Astronomers observed 26 new black holes in the galaxy, which is the largest haul of black hole candidates ever found in a galaxy that isn’t our own. Most of those new black holes have about five to ten times the mass of our Sun. Seven of the black holes were found within 1,000 light-years from the center of the galaxy. Astronomers expect to find many more black holes in the Andromeda Galaxy in the future. 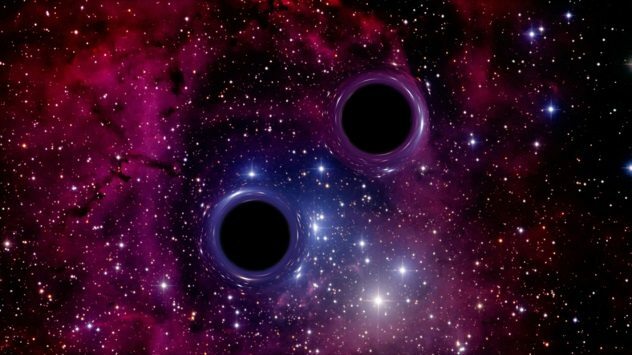 In 2017, two supermassive black holes were found. They’re the closest-orbiting pair ever documented. The two could catastrophically collide in less than 350 years and merge as one large black hole. The two are currently 0.01 light-years apart, which is just a few hundred times the distance of the Earth from the Sun. Not only is the number of black holes in the Andromeda Galaxy impressive, but the way they are moving is amazing. Globular clusters are densely packed collections of ancient stars, and they contain hundreds of thousands or even millions of stars. These globular clusters can help determine the age of the universe or even help figure out where the center of a galaxy is. Astronomers have identified 200 globular clusters in the Milky Way, and about 450 have been observed in the Andromeda Galaxy. The number could be much higher for the Andromeda Galaxy, though, because the outermost regions of the galaxy have not been researched enough. 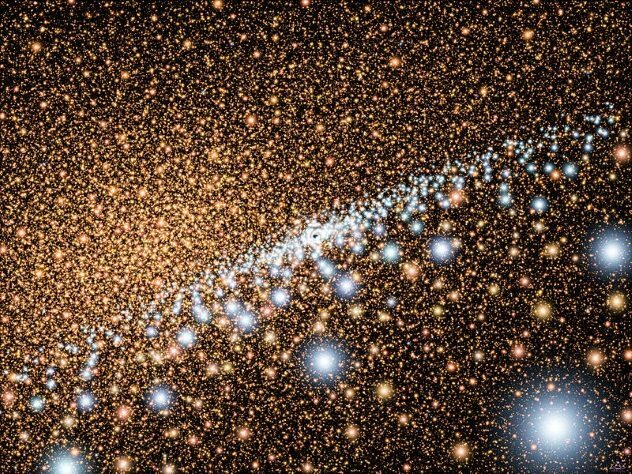 If the globular clusters of the Andromeda Galaxy have the same range of sizes as those in the Milky Way, then the real number of clusters in the galaxy could be anywhere from 700 to 2,800. A nebula is a massive cloud of gas, dust, hydrogen, helium, and plasma, and it is the place where stars are born. Distant galaxies have often been mistaken for these massive clouds. 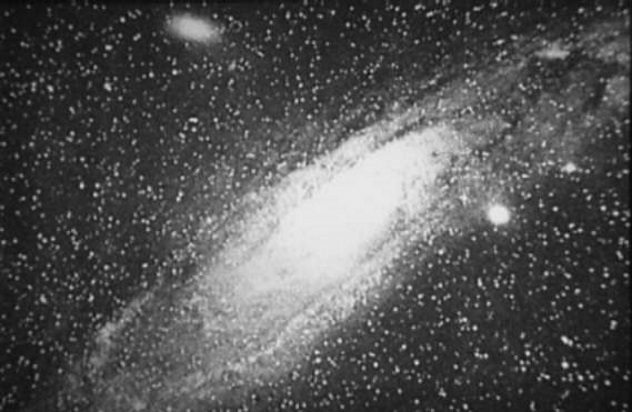 In 1924, astronomer Edwin Hubble announced that the spiral nebula Andromeda was actually a galaxy and that the Milky Way was not the only galaxy in the universe. Hubble found a number of stars in the Andromeda Galaxy, including Cepheid variable stars. Cepheid variable stars vary from bright to dim and can be used to measure distance. He figured out how far away these stars were, and that helped him calculate that the Andromeda Galaxy was 860,000 light-years away, which is more than eight times the distance of the farthest stars in the Milky Way. 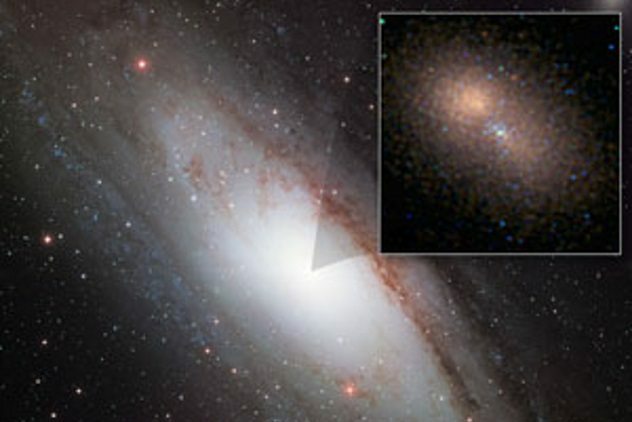 This proved that Andromeda was in fact a galaxy and not a nebula as first suspected. Hubble later went on to document another couple dozen galaxies. Read more galactic facts on 10 Most Bizarre Galaxies In The Universe and 10 Unsolved Stellar Mysteries In Our Galaxy.